It starts with the building. The Charlesgate of the title is a real building in Boston’s Back Bay, originally a hotel catering to the upper crust when it opened in 1891. 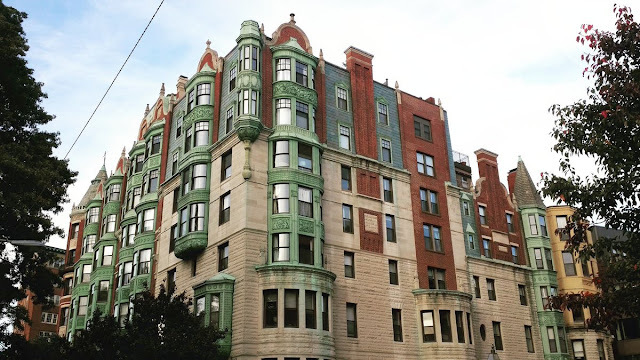 Designed by architect J. Pickering Putnam, it’s an unusual building in a mix of styles, with Gothic spires and the faces of cherubs peeking out from the ornate exterior walls. Almost from the beginning, the Charlesgate had a haunted reputation that persists to this day. My own fascination with the building dates back to the mid-1980s. After the hotel fell on hard times, it was sold to Boston University and, later, Emerson College as student housing. I was assigned to Charlesgate Hall when I arrived as an Emerson student in 1985 and lived there for the next three years, excluding summer vacations. Many of my friends have ghost stories from those days, but I have none. Still, my time in Charlesgate stuck with me through the years, long after Emerson sold the building and it became luxury condos. I wanted to write something that would incorporate the different eras of the building, but I wasn’t interested in telling a ghost story. One early attempt was a screenplay incorporating time travel, but I didn’t get far with that one. I love the city of Boston and I love Boston crime novels and movies. I decided to write a crime story that would play out in three time periods—the 1940s, the 1980s, and the present day. The ’40s era would evoke the postwar film noir genre, with the Charlesgate having fallen into the hands of the mob. In the ’80s section, I revisit my own time in the building, incorporating autobiographical elements into the story. The present day would tie it all together and bring resolution, in part through a police procedural. Now all I needed was a big crime to sustain it all. The Isabella Stewart Gardner Museum in Boston was robbed in the early morning hours of March 18, 1990, by two men dressed as police officers. A security guard on duty let them into the building, after which he and his co-worker were bound with duct tape. The intruders spent the next 81 minutes collecting 13 works of art, and they weren’t gentle about it; masterworks by Rembrandt and Vermeer were slashed from their frames. The art, now valued at half a billion dollars, has never been recovered. The thieves have never been identified. This unsolved crime was perfect for my purposes, except for one thing: I needed it to happen in the 1940s. Rather than concocting my own fictional art heist, I plucked the real thing out of 1990 and dropped it into 1946, using as many details of the actual crime as I could. (Isabella Stewart Gardner, who died in 1924, had stipulated in her will that her collection remain unaltered for the life of the museum, which is why empty frames now hang where the stolen art was once displayed.) I now had my crime, but rather than start my novel with the heist and proceed chronologically from there, I decided to deploy a more unusual structure that would make the novel more fun for me to write (and, I hoped, to read) … if only it would work. So: The first chapter I wrote took place in 1946 and dealt with the robbery of a mob-run poker game on the top floor of the Charlesgate. At chapter’s end, the dealer is left fuming and plotting to find the masked men who took the loot. Who were they? I didn’t know and didn’t care, because now I was off to 1986 and a Ouija board séance held in a dorm room in the same building. Since I identified most closely with the 1986 storyline, I decided to write those chapters in the first-person, from the point of view of journalism student Tommy Donnelly. The third chapter took place in the present day (which was 2014 at the time), depicting the murder of a real-estate agent inside one of the condos for sale in the Charlesgate building. After that it was back to 1946, and so on through the rotation of these three timelines. The Charlesgate, in Boston’s historic Back Bay neighborhood, is now filled with luxury condominiums. How it would all connect I didn’t know at the time. I had no spreadsheets or note cards tacked to the wall connected by string, like a TV detective hunting a serial killer. All I knew was that I wanted what at first appeared to be three unrelated story lines to come together, piece by piece and twist by twist, as the novel unfolded. By the end, everything would snap into place like a Rubik’s Cube, and you’d have the complete picture. I’m not sure what made me think I could pull this off, since this was my first novel, but I had the time of my life writing it anyway. One of the connecting elements, aside from the Charlesgate building, was the rising and falling fortunes of the Red Sox, always burbling in the background during baseball season in Boston. As a huge Red Sox fan, I am very familiar with their colorful—and, until recently, tormented—history, and it was great fun to weave it through the background of my characters’ lives. Not all of it was pleasant to relive—even casual baseball fans of a certain age will recall the ball rolling through Bill Buckner’s legs in game six of the 1986 World Series—but at least I had the solace of three recent world championships to see me through. When I finished the book, I could picture it wrapped in one of those pulpy retro covers that Hard Case Crime specializes in, but had little hope I could actually make that happen. After a negative experience with one agent, I was ready to put Charlesgate in a drawer and move on, but decided on a whim to e-mail Hard Case publisher/editor Charles Ardai directly with my pitch. It turned out to be the best decision I could have made; he asked me to send it along, and a few days later he e-mailed me the most glowing acceptance letter imaginable. It’s extremely rare that an unsolicited manuscript receives a publication offer, so I wouldn’t necessarily recommend that tactic, but it worked for me. 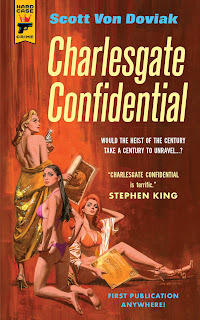 Now Charlesgate Confidential is on shelves, wrapped in one of those classic Hard Case covers, with a gorgeous painting by Paul Mann and a blurb from Stephen King. And it all started with a building.